In a crimson sea, red willows stretch across marshy lands. In early spring the Salix laevigata will bear male and female flowers on separate trees. 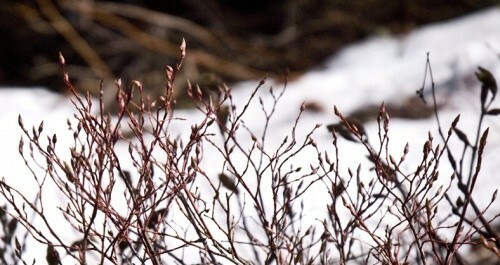 Of these flowers, also known as catkins, the female will produce a downy seed. Indigenous to the northern hemisphere, red willow is not only a strikingly beautiful and fecund perennial, it is, as with most species of willow, used for spiritual practice and medicinal properties. In ceremonies, it was used by Native Americans mainly in relation to air and water. They associated the deciduous, medium-sized tree with these elements due to the seeds being wildly spread by the wind, and because the tree is usually found growing near water. For spiritual use, the Hopi and Navajo used it in crafting prayer sticks and amulets, while other tribes used the wood in crafting representations of the four winds. The bark makes wonderful incense, and it was an integral addition to sacred smoking ceremonies. Inner bark, sometimes combined with other plants, was used in tonics and teas, for pain relief, to treat diarrhea, while the leaves were used to treat colds and sore throats. There is no threat of the tree’s scarcity, as even a felled branch can produce a new tree. With its hardiness and medicinal properties, it is no surprise red willow is still used today for baskets and furniture, treating pain, and for spiritual practices. In health stores and online, it can be bought for tinctures, teas, or to be burnt in spiritual ceremony.